What Are Knee Joint Injections? 1 What Are Knee Joint Injections? 2 How Is A Knee Joint Injection Performed? Recent estimates suggest that about one quarter of all adults suffer from symptoms of chronic knee pain. These symptoms can range in severity from a dull and achy soreness to a sharp and severe stabbing pain. Moreover, both acute and chronic knee pain can lead to impairment in the individual’s ability to function. Other symptoms may occur in conjunction with knee pain, including redness, swelling, immobilization, knee instability, or difficulty straightening or bending the knee. Must Watch Video – Knee Joint Injection Performed Live! Treatment for the symptoms of knee pain largely depends on the source of the pain. While there are a variety of options available, patients are encouraged to attempt more conservative methods first, such as over-the-counter non-steroidal anti-inflammatory drugs (NSAIDs). A portion of knee joint pain patients, however, will continue to experience significant and debilitating pain despite a trial of oral analgesics. These patients may then wish to consider a more interventional approach to managing their pain, before they pursue the possibility of knee surgery. Hyaluronic acid: For this injection, hyaluronic acid is injected into the affected knee joint as a supplement. Hyaluronic acid is a naturally occurring substance found within the joint that provides lubrication and functions as a shock-absorbing cushion. Some instances of knee pain are believed to be the result of a breaking down of this hyaluronic acid over time, which leads to irritation and inflammation. Corticosteroids: For this injection, corticosteroids are injected into the affected knee joint in order to reduce the degree of inflammation in the area. Platelet rich plasma (PRP): For this injection, the patient’s own platelet rich blood plasma is injected into the affected knee joint. It has been suggested that blood platelets release growth factor proteins, which play an integral role in coordinating the repair and regeneration of soft tissue within the body. In most cases, patients report significant reductions in symptoms of knee pain and discomfort within 24 to 48 hours of receiving the injection. Further, the average patient can expect to experience around six to 12 weeks of symptom relief. Some studies have suggested that knee joint injections are safe enough that the patient can receive two or three repeat treatments in order to achieve the patient’s goal of pain relief. How Is A Knee Joint Injection Performed? There are four bones that comprise the knee. These bones include the patella, fibula, tibia, and femur. The bones of the knee are held together at the joint by a number of ligaments and cartilage. Two ligaments located at the center of the knee joint, known as the posterior cruciate ligament and the anterior cruciate ligament, support the knee while it is rotated. Additionally, the lateral and medial ligaments provide support for the knee, while the lateral and medial meniscus cartilage functions to provide cushion for the conjoining ends of the femur and tibia bones. There are three muscles that comprise the knee joint, which are connected to bone by tendons. These include the hamstring, quadriceps, and calf muscles. Given its complex structure, there is potential for injury to occur to any of these structures that comprise the knee. As such, treatment for the symptoms of knee pain and discomfort largely depends on the source of the pain. For instance, tendon injuries can occur as the result of an abrupt twist of the knee while bearing weight. Over time, this tendon injury can lead to degeneration of tissue, irritation, and inflammation of the area, which can all result in symptoms of pain and discomfort. Patients considering knee joint injections will schedule an appointment with a pain specialist to have the procedure done on an outpatient basis. Just prior to the procedure, the physician will thoroughly clean and sterilize the skin in the area of the injection. In many instances, only a topical local anesthetic is needed to numb the injection site. However, some patients may wish to be sedated during the procedure in order to be more comfortable. 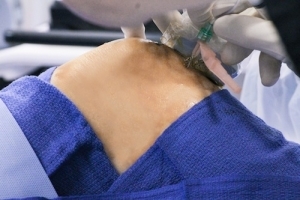 Once the area is prepped, the physician will use a fluoroscopic device, which uses a light and a camera to project an image of the internal structures onto a computer screen, to guide the injection needle into the affected area. The physician will ensure that the injection needle has been properly placed and then will inject the solution. In terms of the platelet rich plasma injections, it is necessary for the physician to draw a sample of blood from the patient prior to the procedure. 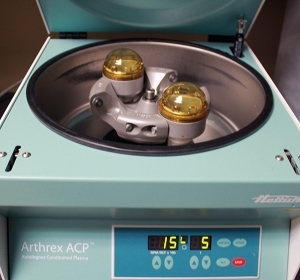 This sample of blood is placed in a centrifuge machine, which spins the container at a rate that separates the red and white blood cells from the blood plasma. This separated blood plasma containing a high concentration of platelets is used for the injection. Complaints of knee pain are quite common among adults in the United States and many cases can be attributed to osteoarthritis. The condition of osteoarthritis has been related to the degeneration of tissue within the joint over time. This leads to irritation and inflammation. Knee joint injections are not intended to prevent conditions, such as osteoarthritis. Conversely, they are recommended most frequently to manage the debilitating symptoms of pain and discomfort associated with these conditions, or that arises as the result of trauma or injury to the structures of the knee. Knee joint injections are a non-surgical treatment option available for managing symptoms of knee joint pain that have been unresponsive to more conservative methods. Several injection options are available and include corticosteroids, hyaluronic acid, and platelet rich plasma. A number of studies have examined the effectiveness and have provided support for the pain relieving benefits of knee joint injections. The procedure is non-invasive and can be conducted on an outpatient basis. Though rare, knee joint injections are associated with some risk.s Patients are encouraged to discuss this treatment option with their physician. Kon E, Buda R, Filardo G, Martino A, Timoncini A, et al. Platelet-rich plasma: intra-articular injections produced favorable results on degenerative cartilage lesions. Knee Surg Sports Traumatol Arthrosc. 2010;18:472-479. Leung A, Liew D, Lim J, Page, C, Boukris-Sayag V, et al. The effect of joint aspiration and corticosteroid injections in osteoarthritis of the knee. Int J Rheum Dis. 2011;14:384-389. Lockman, L. Knee joint injections and aspirations. Can Fam Physician. 2006;53(11):1403-1404. McGarry J, Daruwalla Z. The efficacy, accuracy and complications of corticosteroid injections if the knee joint. Knee Surg Sports Traumatol Arthosc. 2011;19:1649-1654. Sampson, S, Reed N, Silvers H, Meng M, Mandelbaum B. Injection of platelet-rich plasma in patients with primary and secondary knee osteoarthritis: a pilot study. Am J Phys Med Rehabil. 2010;89(12):961-969.